Justin's avatar is Vault Boy from the Fallout series, while Susan's avatar is Vanellope Von Schweetz from Wreck-It Ralph. 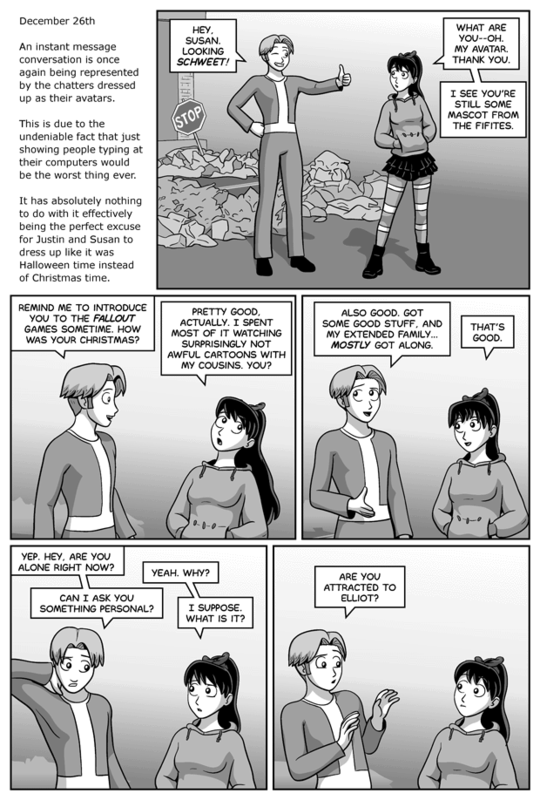 It took me a while to figure out what avatar Justin would be using in this comic. There are a lot of obvious choices for him, but I wanted to go with something less predictable. I actually considered having him be a My Little Pony, well, pony at one point, but I wanted Justin to still be recognizable as Justin, not to mention all the additional ways that would have complicated matters. In any case, I'm a big fan of the two 3D Fallout games (I haven't yet played Fallout 1 or 2), and I'm fairly certain Justin would be as well. I think Susan would like a lot about them, too, but whether or not she'd put up with having to play the gamse to get the stories is another matter. Then again, there are certain villains in Fallout New Vegas she'd probably go out of her way to clobber, so who knows.